How Does the Health Care Law Affect My Business? 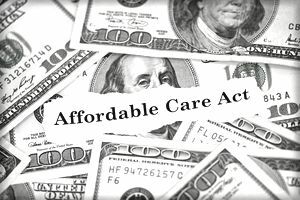 The Patient Protection and Affordable Care Act of 2010, otherwise known as "Obamacare" or the "Health Care Law," affects small and large businesses in several ways. How the health care law affects your business depends on the number of people you employ, either full time or part time (not counting independent contractors). Businesses that employ fewer than 25 full-time equivalent (FTE) employees may be eligible to receive a small business health care tax credit for providing health care coverage to employees. First, you must determine the number of full-time equivalent (FTE) employees, including each part-time employee as a percentage of a full-time employee. Then you must cover at least 50 percent of the cost of health care coverage for some of your employees, based on the single-person rate, and you must pay average annual wages below $50,000. If you meet all of these qualifications, you must apply on IRS Form 8941 (PDF) to receive the tax credit when you file your business tax return. Small businesses with fewer than 50 employees are eligible to purchase health insurance for employees through a state or federal insurance exchange. Employers with 100 or more employees don't have to offer coverage to all employees; they must offer coverage to 70% of full-time employees in 2015 and 95% in 2016 and beyond, to avoid tax penalties. Starting January 1, 2015, large businesses (those with 50 or more full-time workers) that must provide health coverage and do not provide adequate health insurance will be required to pay an assessment if their employees receive premium tax credits to buy their own insurance. These assessments will offset part of the cost of these tax credits. The assessment for a large employer that does not offer coverage will be $2,000 per full-time employee beyond the company's first 30 workers. To be deemed "affordable," the health care insurance provided by the employer must pay for at least 60 percent of covered health care expenses, and employees may not be forced to pay more than 9.5 percent of their family income (before deductions and adjustments) for coverage offered by employers. The question of how an employer is supposed to know the amount of "family income" is not yet addressed. Larger employers (with over 50 employees must also file reports on the health care coverage they provide employees, giving copies both to the IRS and to the employees for their tax returns. The employee reports are for the purpose of enabling employees to show they have health care coverage. The ACA has two types of seasonals, depending on how much and how often they work. Seasonal workers are those hired on a temporary basis, like for the holidays (fewer than four months or 120 hours). Seasonal employees are hired occasionally and for six months or less each year, like summer workers. If your total number of employees is over 50 full-time equivalents and some of those were seasonal workers (not seasonal employees), those seasonal workers aren't counted in your count for the purpose of determining whether you are a "large employer." More information on how the Affordable Care Act affects your small business is available from the Health and Human Services Healthcare.gov site.